Koh Loy is a very small island connected to the mainland of Sriracha by a long bridge. The evening time on Koh Loy is very popular for relaxation. A lot of visitors, especially local people, go there in order to respect Luong Phor Phiw at his shrine, ex-abbot of Wat Srimaharacha. In the pavilion, there is also the picture of Luong Phor Phiw. Additionally, there is Guan Yin Statue on the hill behind the island fro visitors to respect as well. Koh Si-Chang is a large island, counted as a separate district in its own right in Chonburi province. You’ll find an international pier for freighters here while locals stay more to the east of the island. Relax with a traditional three-wheel taxi and visit the fascinating sights to see around the island. Sriracha Tiger Zoo features 400 Bengal tigers as well as other animals, such as thousands of crocodiles. Besides, the zoo has several other animals such as crocodiles, ostriches, single hump camels, kangaroos and an aviary of exotic birds. Exciting shows are Crocodile wrestling, Kenya aerobics, Amazing Circus and Pig Racing. This is a beautifully made four-storey Chinese temple located on the coast from Ang Sila to Khao Sam Mook. It was built to commemorate the 72ndanniversary of His Majesty’s accession to the throne. Decorated in Chinese style, it is one of the most beautiful of its type in the eastern region of Thailand. Some of the special features of the temple are its 2,840 dragon sculptures, the sacred censor Fah-Din pole, and its 60 Tai Sua Ea statues. Khao Kheow Open Zoo at 5,000 rai, is one of the largest open zoos in the world with 8,000 animals of more than 300 species, and it is the only natural park in Chonburi province. You will have no problem getting up close to observe. Another endearing feature of the zoo is its five-rai aviary that features flamingos and many other winged creatures. Sai Thip Butterfly Garden is the biggest of its type in Asia. Inside the garden, the complex lifecycle of the butterfly is exhibited and explained and there are displays of many species of butterflies. The butterfly farm is also well known for its rich flower displays and a fascinating butterfly museum, orchid garden, and souvenir shops. Nong Nooch Tropical Botanical Gardens is a great destination for visitors who appreciate the quieter and more tranquil side of life. The 1,500 rai garden is decorated with thousands of flowers and palms from all around the world. The gardens also feature traditional teakwood Thai-style accommodation with a conference room, a zoo, circus shows, as well as Thai arts and traditional exhibitions. From Sriracha, it’s an easy drive to many other well-known beaches in Chonburi Province. It’s all a question of time… If you’re in a hurry, go to nearby Bangsan Beach. 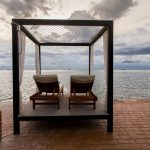 Entertainment lovers and partiers will naturally gravitate to Pattaya Beach while those who appreciate a bit of peace and quiet will head to Bang Saray Beach with its more laid-back and authentic Thai atmosphere. All beaches feature water sports and great seafood dining locations as well as ample accommodation choices.